When I moved here over 37 years ago, the ethnic food in the area was limited. In 1980, a gentleman by the name of Ahmad Younis and his family moved to the Fargo area because he could not find the work he was looking for. In 1990, he opened a street trailer (the first one in the Fargo-Moorhead area to my knowledge). He and his brother Younis Younis, opened their first restaurant, Aladdin's Market and Deli, in 1994 on Sixth Avenue North in downtown Fargo. 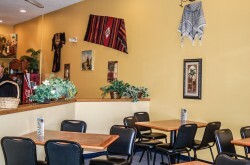 Ahmad describes Cafe Aladdin’s fare as a mixture of Greek and Middle Eastern cuisine. Whenever I think of Middle Eastern food, gyro and hummus come to mind. Ahmad said another popular item on the menu is the shish kabob. The restaurant also offers a halal gyro by request. The brothers have done very well for themselves. Cafe Aladdin now has three different locations in the Fargo-Moorhead area. Its most popular stop is located downtown. The other two are housed on 32nd Ave. and 13th Ave.
Cafe Aladdin offers food for everyone. 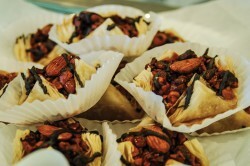 The staff can prepare vegan, vegetarian and gluten-free meals for customers. There are even children-size plates. 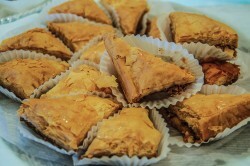 It also has a little deli where they sell items such as feta cheese, kalamata olives and baklava, a traditional dessert. In the times of many different restaurants opening throughout the Fargo-Moorhead area, it's great that these two brothers have not only been able to stay open but also to expand. So with that said, I hope you visit and enjoy their food. 9. Would I go back and would I recommend it: Absolutely!